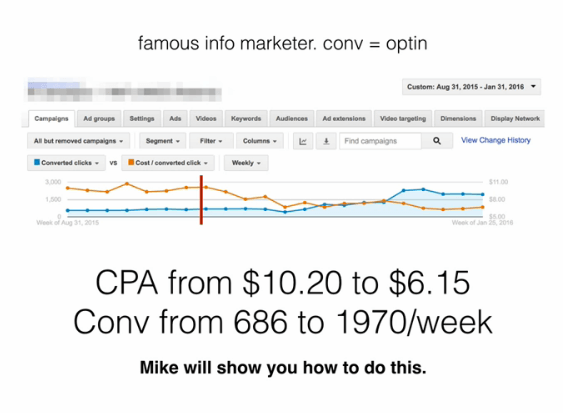 In 5 Modules, AdWords Expert Mike Rhodes Will Transport You to The Top 1% Of All Advertisers On Google’s Display Network. DISCOVER HOW TO GET 1,000, 5,000, EVEN 50,000 CLICKS PER DAY – FOR LESS MONEY THAN THE OTHER 99% PAY. Google has lost some of its arrogance. Google is now NOT the only game in town for traffic. Facebook is justifiably HOT. And Google knows it. And there isn’t anything they can do to stop it. They can’t even spider a lot of the activity on Facebook. But believe you me, they are working like crazy to match Facebook’s pace and remain the 800 pound gorilla. Which includes some very advanced, sophisticated audience profiling. And while the world is all gaga over Facebook, most people are ignoring a goldmine that’s right under their nose. Display Network is half of Google’s revenue and Google has been sharpening their game while you’ve been ignoring them. Are You a Google AdWords Consultant? Master Display Network and Leapfrog Over 80% of Your Consulting Competition. When you can produce leads and sales from the Display Network (which to most people is an opaque mystery-box) then you can overwhelm your clients with proof that other consultants simply cannot produce. Which is why we’re providing an Expert Training with Mike Rhodes. Mike Rhodes is one of the world’s most skilled Display Network jockeys, and he’s a discerning, relatable mentor and guide. SO YOU CAN TEACH IT TO YOUR TEAM! Google’s Tag Manager. Should you use it? Why, and most importantly, how? GOOGLE’S JOB IS TO THIN THE HERD. MY JOB IS TO MAKE MY HERD FAT. 2% of the advertisers get 50% of the traffic. My job is to equip you to land in that top 2%. The other 98% fight over the scraps. In market after market after market, one or two of the top 5 advertisers are my students or students of people I’ve coached. AdWords is vastly more complex than when it was introduced. Our friends in Mountain View continue to throw up smoke screens…and slaps…and right side wipeouts. The devil’s in the details. The details will either swallow you up, or they’ll open up new opportunities for capturing even more profitable traffic. Opportunities that are increasingly difficult for rivals to mine. The gulf between the winners and the whiners continues to widen. The Least Understood Aspect Of AdWords? The Display Network is, in my opinion, the least understood and most tragically ignored territory in AdWords. If Search is checkers, Display is Chess. Risker, but far more rewarding. For some advertisers a treasure trove of quality traffic. It’s the largest advertising network in the world. It’s gotten steadily better for the last 8 years but most people still burn their money on bad visitors. I don’t know of anyone better than Mike Rhodes to show you how to find the hidden gold in the mysterious cloud of the GDN. Good news if you have ears to hear it: Not one Google Display Network advertiser in 200 harnesses all the techniques Mike will arm you with in this four-week Boot Camp. You will be well-armed for battle and the things that trip up most people will NOT get in your way.